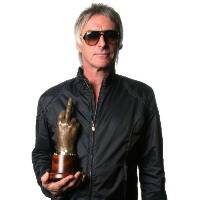 Paul Weller: Godlike Genius Award For Modfather! – Paul Weller News! Paul Weller: Godlike Genius Award For Modfather! Chart veteran Paul Weller is to receive a top honorary prize at this year’s NME Awards, the annual Godlike Genius title, it was announced today. The former frontman for The Jam will receive his award later this month and perform at the event which takes place at the O2 Brixton Academy in south London. The bash, officially titled the Shockwaves NME Awards 2010, is to be hosted by Jarvis Cocker and will be staged on February 24. The winner of the Godlike Genius award is chosen by music magazine NME to honour a figure or group who has helped to shape the musical landscape over the years and past winners have included New Order, The Clash, Ian Brown and Manic Street Preachers. Weller achieved a string of hits with The Jam such as Eton Rifles and Start! before they disbanded in 1982. He bounced back with The Style Council the following year and then launched a solo career in the early 1990s, achieving hits such as You Do Something To Me, Wild Wood and The Changingman. Previous Entry Paul Weller To Play A Second Night In Amsterdam! Next Entry Paul Weller To Be Interviewed On NME Radio February 10 (Wed 4pm)!